AFTER Namche Bazaar, I thought things could not get worse. The next day we went on to Tengboche. I chose a hotel named Tashi Delek, where it turned out that none of the staff knew my guide. He thought he had to sleep on the couch in the dining hall; but guides were given their own rooms! He said he had stayed there seven times. Yet the common story everywhere was that no one knew him. Our porter stayed at the porter house, where the arrangements were just mattresses on a floor in a warm building. This was more communal than the private rooms for guides, though they got great food. Had my supposed guide only been to Tengboche previously as a porter? From Tengboche, which is officially at 3,867 metres elevation, we were going to Chukhung (a bit of a hike, which would take seven hours and one that would gain about 900 metres in additional elevation. We were going to go via a village called Dingboche, which sounds like Tengboche but is a different place, further up the hill, at 4,410 metres. My guide said his leg was playing up. He said that he could not walk properly and that he would go slowly. He then blamed me for going too fast the previous two days, i.e., getting to the Namche bridge to avoid crowds and yaks. It was snowing when we left Tengboche, and I spoke to a Sherpa woman minding ten yaks. 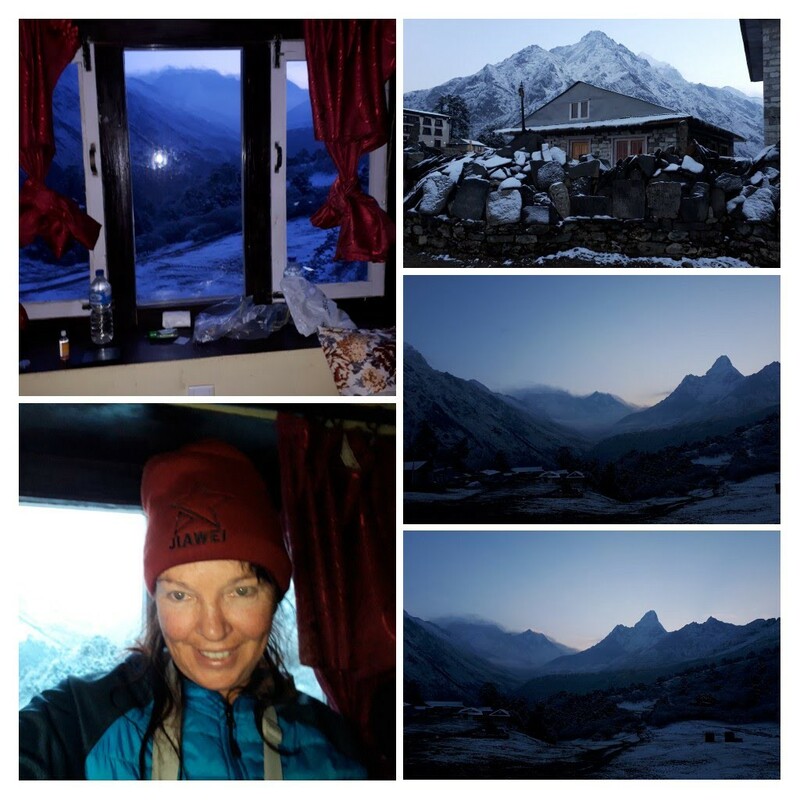 She was going to the village of Gorek Shep (5,164 metres), near Everest Base Camp. Gorak Shep is so high up that it is not occupied in winter. I asked why she was not a mountain guide, if she hiked all the way up there and back: her job did not have to be in the kitchen. It snowed every day. The visibility on the way to Chukhung was going to be really bad. In Dingboche, we stopped in at a café called Mama’s Bakery and had the best momos ever, even though Dingboche was pretty much in the middle of nowhere. Momos are a kind of local dumpling, which is a staple food. 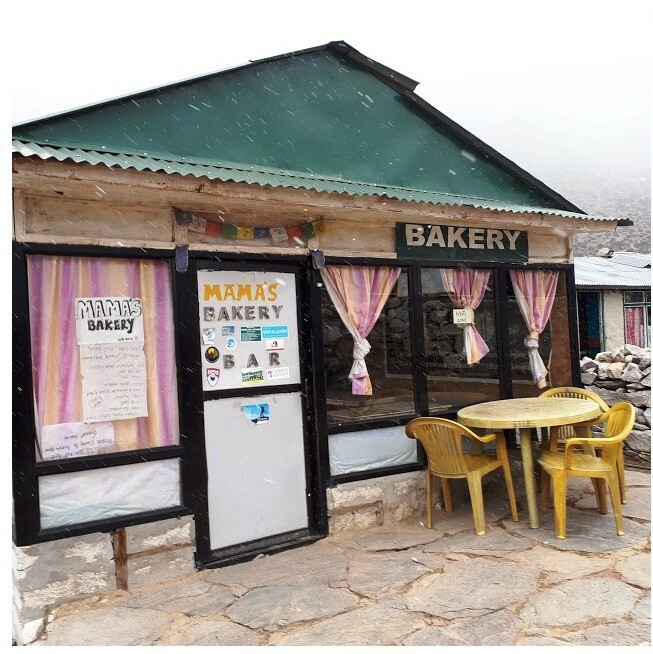 Mama’s Bakery adjoins a guesthouse called the Green Tara Lodge, which is owned by Yahjing, a lovely lady from Namche Bazaar, and her husband Tashi. Yahjing told me that Tashi was Tibetan, a former Buddhist monk, and that they had married thirteen years previously and had two children. I visited the toilet and it was so clean that I thought I would stay at the Green Tara Lodge on the way back down, if it wasn’t full. I was attracted to the unusual cakes in Mama’s Bakery: for instance, a garlic, lemon and ginger cake! And, to the Tibetan flag on the wall and the Buddhist altar. My guide went through to Chukhung very fast. I met so many other trekkers throughout the whole way who were concerned for my welfare. Several people had commented that 900 metres in one day was dangerous and that to do a peak within six days of my arrival in Nepal was even more dangerous. That is to say, that such rapid ascents risked altitude sickness. My guide said this was fine and was no problem: but he just appeared as an imposter. He got to Chukhung by 1pm: what had happened to his bad knee, and why the erratic behaviour? Anyhow I met this amazing English guy who was carrying his father’s ashes. His father was a mountaineer who had been at least part of the way up Everest and had died ten months previously. The Englishman and his wife were meant to be doing the Base Camp trek to Everest, to spread his father’s ashes at the Base Camp. But his wife had become pregnant with their second child, due on his father’s birthday, and so she wasn’t able to go all the way. He freaked out about the date coincidence: I said it was normal and I had known other people who this sort of thing had happened to. He was helpful, and I walked with him for about an hour. He was recounting his fathers’ descriptions of the track, from memory. What an amazing goodbye. Then I met a couple from Poland, who took a trip once a year for two weeks without their kids; then took a trip once a year with their kids. They were breathless getting up the hill to Dingboche and we walked together for two hours. Later I would meet them at Mama’s Bakery and we shared a helicopter together on the way back to Kathmandu, all by chance. The couple were staying the night in Dingboche: so, onward and upward to Chukhung by myself. I had paid $4000 US for a guide recommended to me by a friend in France, and this guide was nowhere to be seen, having gone on ahead of me. I got lost out of Dingboche as the visibility was poor, with low cloud and sleet. 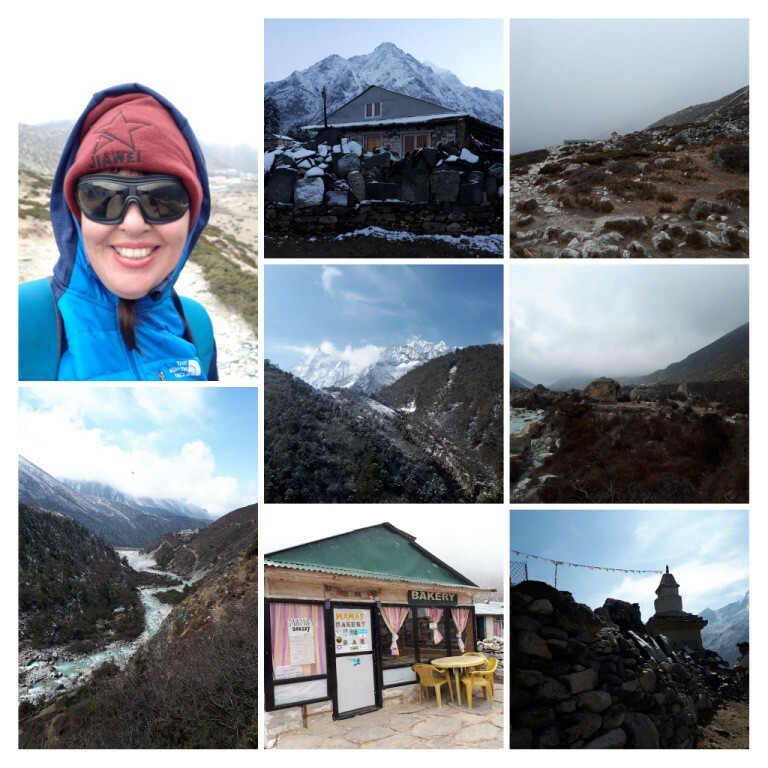 I almost wandered off the track and up a hill instead and had to ask porters and ordinary Nepalis how to get to Chukhung. The vegetation was sparse, and pregnant yaks grazed on the new Spring growth. My guide sent the porter to find me at 4pm. I was staying at the Sunshine Eco Lodge in Chukhung. After I had arrived a Singaporean tourist asked, in what was now becoming a familiar mantra, what is wrong with your guide? The Singaporean’s name was Siri. His guide was amazing: he ran around, got the food, and asked if Siri was ok. Never once did my guide ask if I was ok: it was all about his knee, followed by a blister. Siri’s guide had maps, and they discussed the trail, about the precise route they should take up the Island Peak Summit. My guide had no map, no drinking bottle (he borrowed mine) and no sufficient snow gear. He and his brother owned the agency I had hired him from: ironically enough, an agency that seemed to have lots of other bona fide guides. I was really wanting to trust my guide to take me to the top of Island Peak. He said he was Nepali and did not need a drinking bottle- so he just drank mine! I noticed our porter, a man called ‘D’, was really tired. So, I fed him for the next two days. The owner of the lodge told me not to talk to people, or to talk so loudly, which I thought was a bit much. Then he charged me US 80 for hiring boots and other equipment. Siri only paid for one day: I paid for two days hire to be on the safe side. I decided to leave the Lodge abruptly when I was told I could only wear the mountaineering boots from Island Peak Base Camp: a three-hour walk up and another 500 metres in elevation. I had put my orthopaedic insoles into those boots and could not easily take them out and use my hiking boots as it taken an hour to put my insoles into these mountaineering boots. After this insult, I left early for Island Peak. The room my guide initially booked me into was dark and dingy and I asked for a better room. The only difference was that the covers on the bed were cleaner. There was mould in the walls and another guest complained that the water froze in her drinking-water bladder. I had stayed at a better hotel in Chukhung on my last trip, and just did not like the mould: you get sick. And on top of that, the owner was a control freak telling me not to talk to anyone!